Last night, sophomore forward Breanna Stewart led her UConn Huskies to their second-straight NCAA title and ninth overall. Her stat line offered a little of everything: 21 points, nine rebounds, four assists, two blocks. "The first Durantesque player in the women's game," her coach, Geno Auriemma, called her last month in Emma Carmichael's Sports Illustrated cover story, suggesting a sport on the verge of an overdue evolutionary leap. If you want a good idea of what kind of player Breanna Stewart is, look no further than Carmichael's profile. As she puts it, women's basketball has never really seen a player like Stewart: one who's big and strong enough to bang away in the paint, but also skilled and coordinated enough to hit shots from long range while creating for herself and others off the dribble. One reason is that women's basketball, a coach's sport if there ever was one, has clung to certain positional archetypes at all levels of the game. If you're a tall girl, you're steered toward the frontcourt; if you're short, you're put in the backcourt. Talent is developed to fit these pre-existing roles, and the result is a less liberated version of what the game could be, something the men's version has spent the past decade slowly figuring out (the FreeDarko crew used to call this era the "Positional Revolution"). Ideally, prototypes beget more of the same. Imagine three or four Stewarts in the college game next year — and in the WNBA a few years down the road — and you can imagine the sport changing on a fundamental level. (To begin: Someone in the country would be able to stop Stewart.) Auriemma believes that players overseas are a step ahead in this regard. "In Europe they don't just throw you in the post," he says. "They work really hard at making you a basketball player instead of just a low post player. Stewie can take that to another level, where, yeah, I'm 6' 4", but I play like a guard." Stateside, he just doesn't see enough players taking it to the same extreme — doing the daily mile-long dribbling routine, for example: "Do enough people do that around the country? I don't think so." But Stewart wanted to, and that represents a shift, albeit a small one. If players such as Delle Donne and Jackson laid the foundation for Stewart's game, she is now taking it to a new extreme. Dailey has already seen a change in the high school ranks: "From a recruiting standpoint there are no big kids who want to be in the lane. Everybody thinks they want to shoot threes. In the future it's probably gonna be more remarkable that somebody like Stefanie can dominate inside the way she does." Hypothesis: It's a sign of the sport's health when the best players on the floor are also the most versatile players on the floor. It suggests that the developmental system isn't stuffing talent into narrow pipes, and it suggests that coaches are willing to experiment, defy prevailing orthodoxies, and let players be their best selves instead of fitting them into rigid systems. Stewart is doing for women's basketball what John Havlicek, Julius Erving, and Socttie Pippen did for the men's game: she's creating new possibilities. 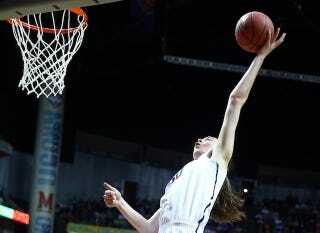 With any luck, the future will see the rise a lot more players like Breanna Stewart.